Friday I spoke at a local mom’s group about meal planning. It is truly a blessing to share this ministry with other moms and share the five key steps for helping busy families get dinner on the table. I love the opportunity to connect with other moms and share what works for me. The conversations easily lead to other related ideas and everyone sharing resources about many mom topics. Mom’s want to relate with one another. They want to know they are not alone. They really seek answers that will help them be the best home manager possible. I love watching it all unfold! I admire a room full of women who are all going through different seasons- some with teenagers, some with wee little ones and everything in between. Everyone sharing and thriving off one another. One of the questions that was asked Friday was about snack ideas for kids and how to do this in a budget friendly way. It reminded me that many of us are seeking ways to save money and bring healthy value to our lives. We are all after the same goals. Here are my snacking tips. 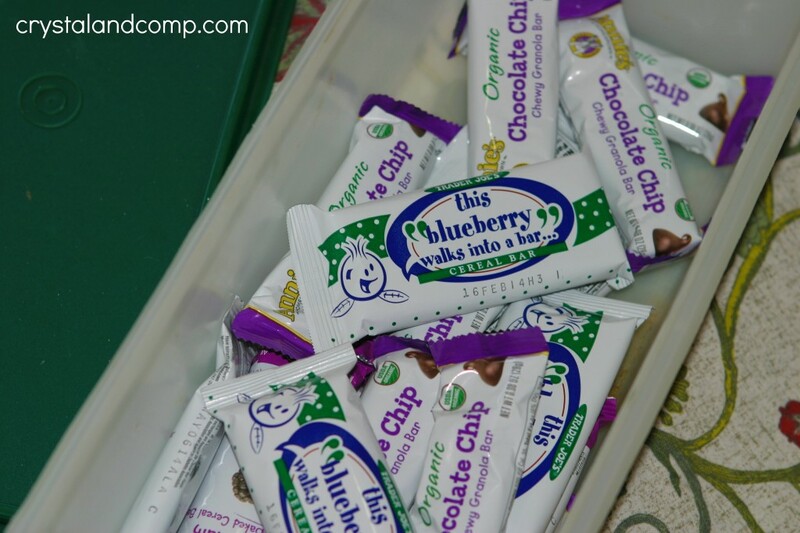 One thing I suggest is creating a snack drawer in your fridge that is easy for your kids to reach. I shared this a few years ago here on my site. My kids know that they have to ask first, but it is all in their reach. Even my nieces and nephews and friends’ kids know the routine when they are here. Here are some of the things I keep in this drawer. You can use these fridge drawer liners too. We love them! Sometimes the drawer is more organized than other times, but the point is everyone knows what is available. Then, we have a snack container in the cabinet. It is an old plastic Tupperware bread box that has non-perishable snacks available. Again, they have to ask before they get into it, but all of the snacks in there are things I have approved. Also, don’t forget, I have a letter of the week snack idea if you want to make things fun while you’re learning and snacking. 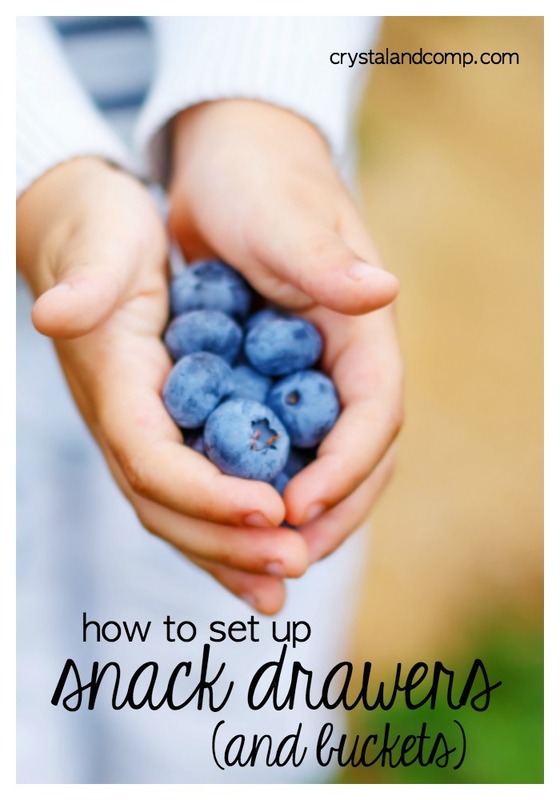 Don’t want your kids snacking on junk? Then don’t offer them junk. Only supply your snack container and crisper drawer with things you approve. It really is that easy. They will only eat what is available. You set the boundary. My kids know they can have one (1) item after they ask. Two mom’s in Friday’s class had an awesome suggestion. 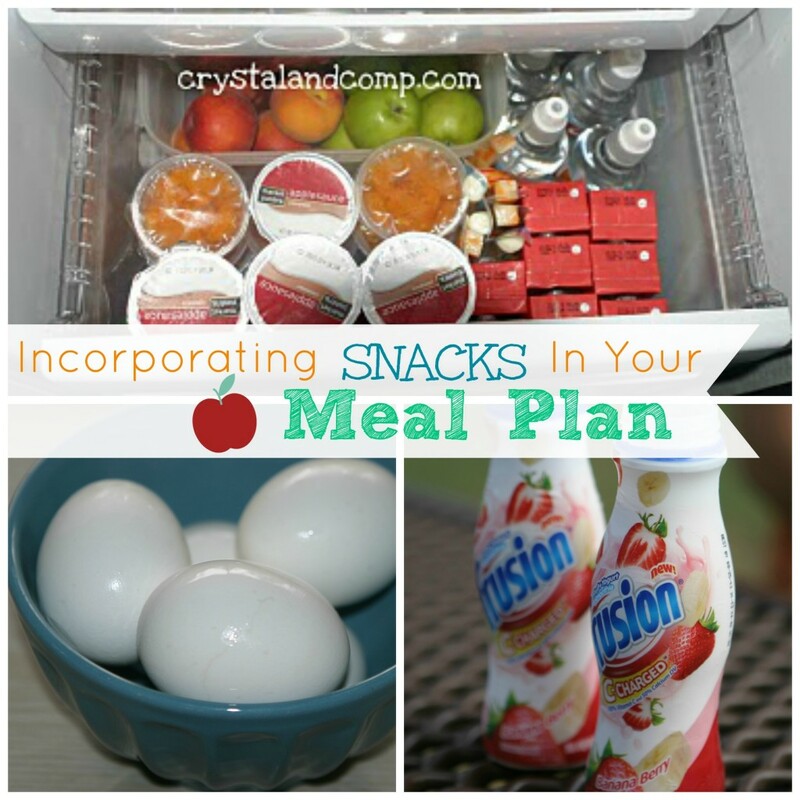 Take larger snacks that come in big containers and break them down into small, one serving, snack size Ziplock bags. You can do this for things like Goldfish and crackers and even for fruits like grapes and such. Start including snacks in your weekly meal plan so that everyone knows what to expect, especially if you’re trying to budget this out and keep an eye on spending. Use my free meal planning printable to help map it all out. And don’t forget to checkout my list if 21 coupon resources for free printable coupons! Looking for a thrifty and all natural way to clean produce? Check out my vinegar and water based fruit and veggie wash.
What’s in your snack drawer? Wow! Really?? Do we know each other and I’m having a brain blockage?? Well nice to meet you – and I”ll be stalking, I mean LURKING, here often. I love snack time! Thanks for sharing. I currently meal plan but I’ve never thought about snacks, and with a teenage boy in the house I really need to!! I’ll be giving your printable a try! Thanks for sharing!! This is a really cute idea!! I’m not a mom, but I remember going to my grandparents house as a kid and going into their cracker drawer when I wanted a snack. It’s great how you can offer healthy snacks this way! I just love your snack ideas! Thank you so much for sharing with Full Plate Thursday and have a great weekend!